When cooking steak recipes, especially for budget cooking, it is very important to know which steaks are the cheaper cuts. Meat, mainly steaks are probably the costliest item on anybody’s food budget. Most people still do not want to completely give up their steak dinners. When learning how to grocery shop, you should also learn which cuts of meat are the most economical to buy. Some steaks like rib steaks are cheaper to buy because they have more fat in them. This is not all bad because the fats adds great flavor to the meat. Before cooking steak recipes, you should learn about other steaks like round or a thick cut round (Swiss steak) which are very tough. These still can make delicious recipes with proper cooking and actually have a much better flavor. To many, meat is the mainstay of most well rounded meals. Beef, especially steak is the choice of a lot of people for its rich juicy flavor. When cooking steak recipes, you will find the nutrients are the same whether it is a cheaper cut or a more expensive cut. It is the flavor which is enhanced by the proper cooking methods that makes it worth buying; you will have to decide if it is worth the difference in price. When cooking steak recipes correctly, you will find several tenderizing methods which will turn cheaper cuts of steak into delicious and appreciated meals. At storage plants before the beef is for sale, it is hung for a specific time in rooms which have the temperature and humidity controlled. You will learn that this AGING improves the tenderness of some of the cuts when cooking steak recipes. After you purchase the tougher cuts of meat there are still ways that you can make the meat more tender. You can purchase meat tenderizers which are derivatives of natural food tenderizing agents found in some tropical fruits. These will soften the meat while cooking; follow the directions and do not use too much or leave it on too long or the meat will become mushy. Do not use it on the more tender cuts of meat. MECHANICAL tenderizing is often done in the market before purchasing. The butcher will run the steak through a tenderizer; this is how cube steak is made. The grinding will instantly tenderize the steak by chopping the fibers. I often pound my round steak producing the same results. I will then roll the steak in flour and brown it. After browning, I pour a little water over it, cover with a lid and simmer until very tender. This is great flavored steak. MARINATING or soaking meat also is a form of tenderizing. Acid mixtures such as lemon juice, vinegar or wines, will tenderize the meat. Most of the time I add herbs and spices to the mixture and it also give a delicious flavor while tenderizing. Tenderizing can be also done during the COOKING PROCESS like placing in the oven after browning or cooking for a longer period of time on the stove top. Lay steak out flat. Sprinkle with salt and pepper. Spread the mustard and the barbeque sauce over top. Arrange the cheese slices over top and roll up like a jellyroll. Close with toothpicks. Lay in a lightly sprayed casserole dish or baking pan. Bake until tender; 60 to 90 minutes. This blade steak recipe is made with a steak that comes from the chuck section. It is a cheaper cut containing tough connecting tissue. Cooking steak recipes properly can turn one like this into a delicious meal. Combine 2 ½ cups water, vinegar, 1 tablespoon brown sugar, salt, cloves, peppercorns and bay leaves in saucepan; bring to a boil. Pour over sliced onions; cool. Stir in oil. Pour marinade over steak; refrigerate 8 to 10 hours, turning once. Remove steak from marinade to absorbent paper; pat dry. 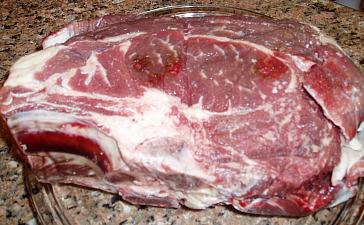 Heat cooking fat in a skillet and brown meat. Pour off the excess fat. Strain marinade and add 1 cup to the steak, reserving remaining marinade. Cover and cook on low for 2 hours or until tender. Remove steak to a hot platter. Add reserved 1 ½ cups marinade to hot pan, ¾ cup water, raisins and 1 tablespoon brown sugar. Bring to a boil. Add crumbled gingersnaps; stir until thickened. Serve gravy with steak. Below are some marinades you can try for different steaks. Cooking steak recipes correctly is knowing to marinate long enough to tenderize but too long will make them fall apart. Blend all ingredients together in a blender. Pour over meat, cover and refrigerate for several hours before cooking. When cooking steak recipes you might want to use bourbon in many of your recipes for a delicious flavor. Blend altogether in blender, pour over steaks. Cover and set in refrigerator for 1 ½ to 2 hours before cooking. After marinating for 2 hours, put the steak under the broiler browning on both side. After broiling place steak in a heavy large skillet or Dutch oven and add the following ingredients. Add all ingredients to the steak, cover and simmer until steak is tender. NOTE: Add water if skillet gets too dry. If desired, the pan drippings make a nice gravy. Beat round steak on both sides; beat in plenty of flour. NOTE: When cooking steak recipes, you will learn that beating flour into the meat will help it to brown nicely. To beat in the flour cover one side with flour and beat with meat hammer or tenderizer, turn steak over, spread with flour and beat that side. Turn over two more times spreading with flour and beating. Heat part butter and part shortening in a large skillet; place steak in skillet, sprinkle with salt and pepper. Sprinkle ½ cup flour over top of steak; brown well on both sides. When steak is real brown cover all with hot water; bring to a boil. Stir gravy around in skillet to make it smooth; cover and steam 45 minutes or until tender. In a baking dish layer bacon across the bottom. Rub steak with salt, pepper and minced garlic; place steak over bacon. Layer potatoes; sprinkle with salt, pepper and minced garlic. Next layer onions and mushrooms; pour in tomatoes with juice and tomato sauce. Cover and bake in oven at 350F degrees for about 1 hour or until meat is very tender. Brown sesame seeds until golden in hot oil. Mix sesame seeds with onions in 9 X 13 inch baking dish. Add soy sauce, lemon juice, sugar, black pepper and garlic. Add steak to this mixture and marinade in refrigerator for about 8 hours; turn occasionally. Preheat broiler and place steak in broiler pan; drain onions and reserve marinade. Broil steak about 25 minutes (or desired doneness) brushing frequently with reserved marinade. In a skillet cook onions with remaining marinade until tender.Serve steak with onions on top. Cook steaks in hot oil on both sides to desired doneness; place on platter and keep warm. Chop 3 tomatoes and slice others. Reduce heat of skillet to medium and add ¼ cup water, chopped tomatoes, green onions, salt and basil. Blend cornstarch with ¼ cup water; gradually stir into tomato mixture. Cook and stir until thickened; add sliced tomatoes and heat through. 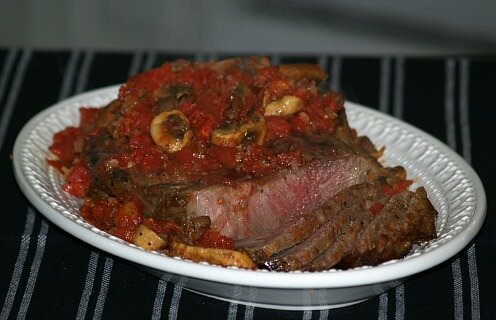 Spoon tomato mixture over steak.